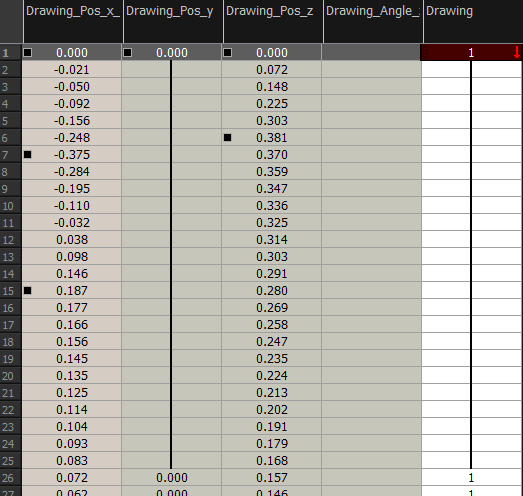 By default, when a drawing layer or peg is added to a scene, no function curves are created. You will generally create the ones you need to avoid being overloaded with too many functions you might not use. When you select an element in the Camera view and move it around, it will automatically create the corresponding function curves. If you need to create certain functions manually, you can always do it through the Layer Properties view or editor. 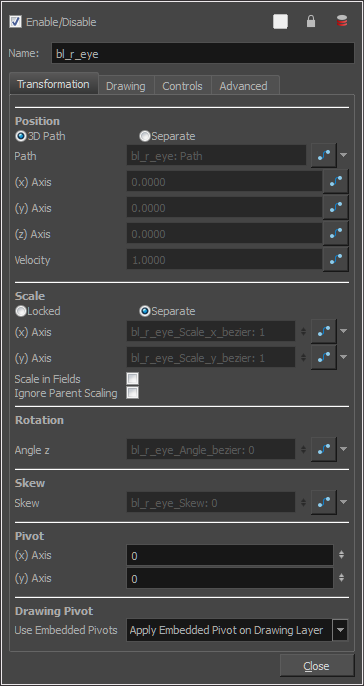 You can then share it with other layer parameters or set keyframes directly on the function curve instead of doing it in the Timeline or Camera view. You can also link a layer's parameter to an existing function curve or attach several parameters to the same function curve. For example, if you have an aircraft performing loops between clouds, you may want the camera to follow the aircraft's motion path. If you attach the camera to the aircraft's layer, the camera will also loop, but this may produce undesirable results and even induce a feeling of motion sickness as you watch the final animation. Instead, you can share the X, Y and Z positions of the aircraft with the camera's peg layer, but ignore the angle, scale and skew. By default, all function curves can only be used and modified using their original parameter. If you want another layer or parameter to use the same function curve, you must share it. Local Disconnects the parameter from any function and changes it to shared. You have the choice of creating a new function curve or linking it to a shared function. This way, you can have two or more parameters following the same function. When you create a function to control a parameter over time (Scale, X, Y, Z, Rotate), you can use a Bezier function. These function editors present different ways of editing the values over time. The shape of the created graph indicates the velocity of the function, regardless of the chosen editor. The type of function that you choose is largely based on your working preference. You can also create Velobased functions for certain effects, like changes in rotation or size over time. When you do this, the Velobased functions are linked to the velocity of a 3D path. You cannot change the shape of a Velobased function to control its velocity. With Velobased functions, you can link changes in rotation or scaling to the velocity of a 3D path. This makes it possible for changes in rotation or scaling to progress at the same speed as changes to the position of an element. 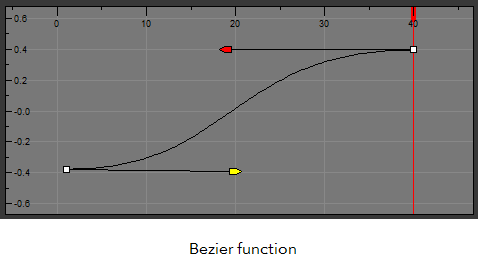 You can convert a Bezier functions so you can edit it using the controls offered by that type of function.